This post is part of the Terror TV Blogathon going on this weekend, hosted by the Classic TV Blog Association. 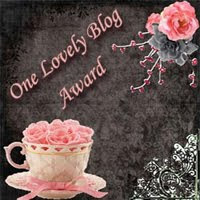 You can click here to read the other fabulous entries. 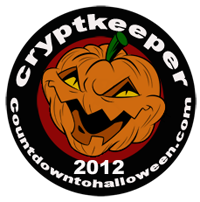 Merry Halloween! 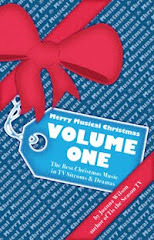 The subtitle for this movie should read: "And you thought YOUR family was trouble for Christmas!" 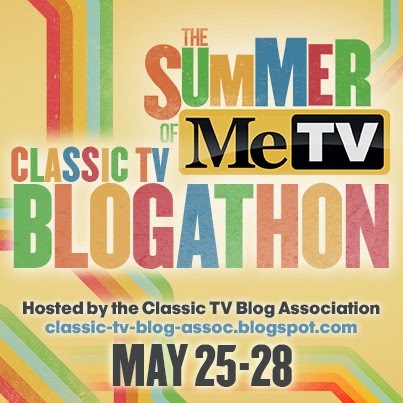 For this holiday weekend blogathon, I want to share about the 1972 made-for-TV movie Home for the Holidays. 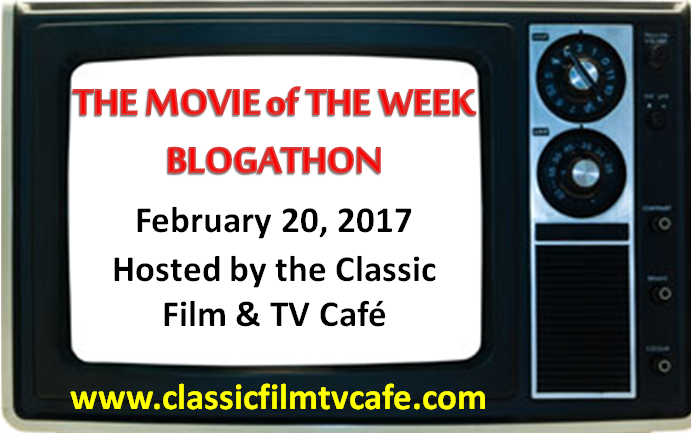 The ABC Movie of the Week was an Aaron Spelling/Leonard Goldberg Production. It is was directed by John Llewellyn Moxey. 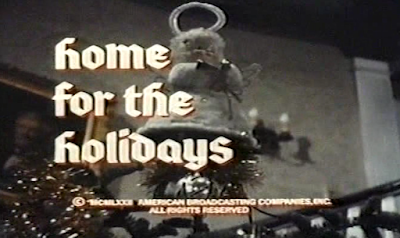 Home for the Holidays fits in perfectly as a Halloween/Christmas cross-over. 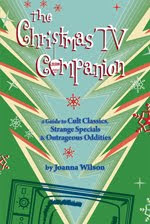 Although the story is set at Christmas, the characters are suspicious, paranoid, off-balance, and driven mad. The creepy movie feels like an old-fashioned, American gothic horror tale with a doomed family mansion, constant storms and rain showers, shadows, secrets and whispers, deceptions, and even murders. 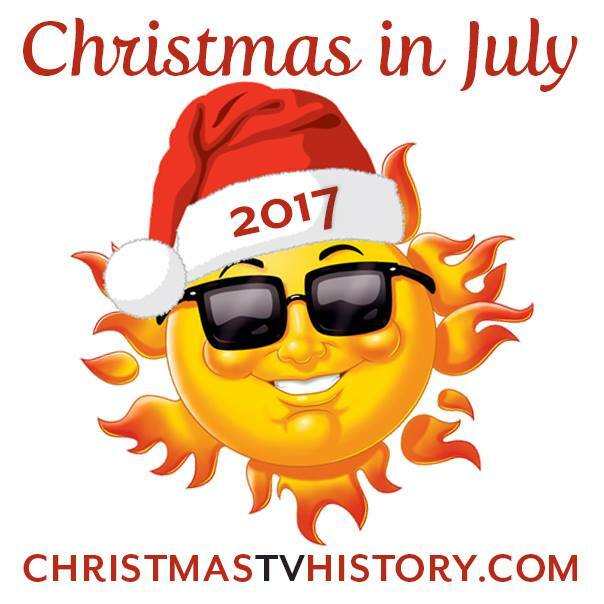 Despite the over-used and now meaningless title, you'll never mistake it for a Christmas TV movie airing on the Hallmark Channel! 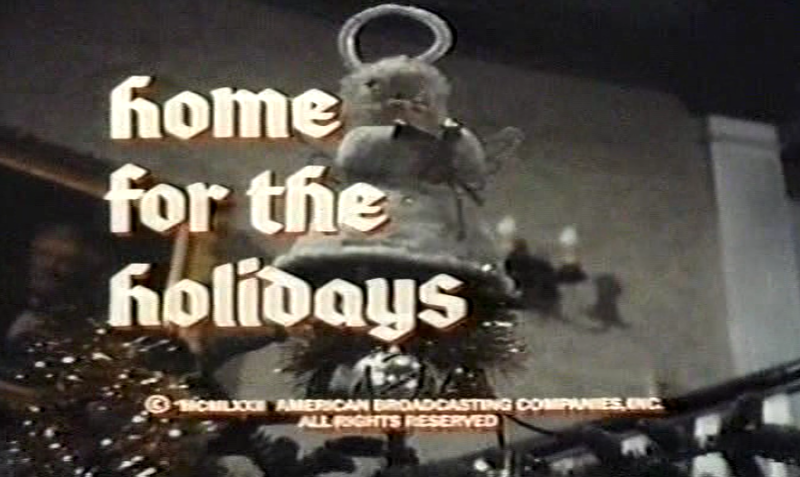 Even though the movie is strong and certainly one of a kind, I fear Home for the Holidays is overlooked because of its rarity. It was released on VHS in the 1980s but there isn't an official DVD release, that I know of. If you want to dig around on the internet, your efforts will be rewarded. 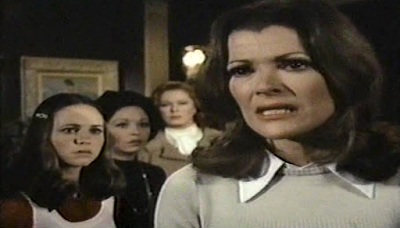 Four sisters left to right: Christine (Sally Field), Jo (Jill Haworth), Freddie (Jessica Walter), and Alex (Eleanor Parker). 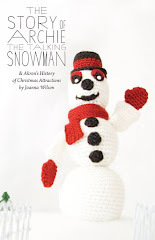 The story begins with the four Morgan sisters returning home for Christmas. That sounds like a happy family reunion, right? Quickly it unfolds that these sisters feel forced to return to the family home they all fled nine years ago. The oldest sister Alex has united her sisters after receiving a note from their father that says, "My wife is slowly poisoning me to death." The wife he refers to is actually their step-mother Elizabeth--the woman he was having an affair with when his first wife/their biological mother killed herself. The sisters blame their father for their mother's suicide and let's just say they don't like Elizabeth. The step-mother Elizabeth is played by Julie Harris. Visiting the family home is a painful experience for the sisters because of the shame and guilt they feel about their mother's suicide. They also have no lost love for their father and his second wife. 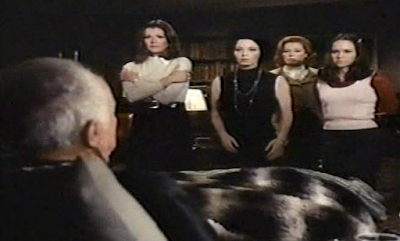 But viewers see Elizabeth welcome the four sisters into her home even though she knows they resent her and don't like her. What an awkward Christmas reunion. Their invalid father thinks he's being poisoned by his wife. He makes sure to announce that his estate is being handed down to his daughters in his latest will. Alex's motivation is expressed efficiently to her sisters, "We may not care if he [Father] lives or dies but we can't let that woman get away with murder. Again." Whether she's speaking about their mother's death or Elizabeth's first husband's mysterious death (for the record, the grand jury decided to pass on prosecuting her), the sisters have reasons to be suspicious and concerned. Why did their father ask them to come? He wants them to KILL Elizabeth. Oh dear. The four Morgan sisters have paid a price for their father's past. The oldest Alex is the responsible one, burdened by looking after her younger sisters. Jo is the bitter, cynical sister that has stopped caring about her father's well-being. Freddie struggles with alcohol and drug addiction, numbing herself from the pain of her mother's suicide. And, the youngest is naive Christine--a graduate student--who struggles with relationships with men. 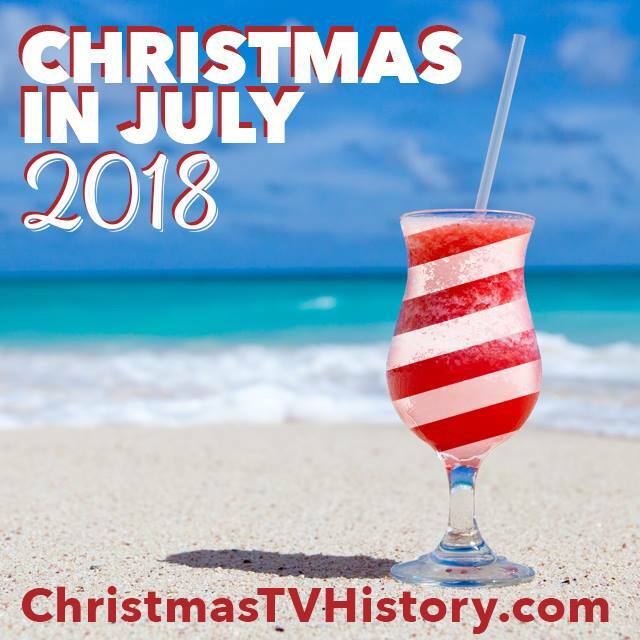 After their father reveals that he's written a new will passing down his money and estate to his daughters, he asks them to kill Elizabeth for him. 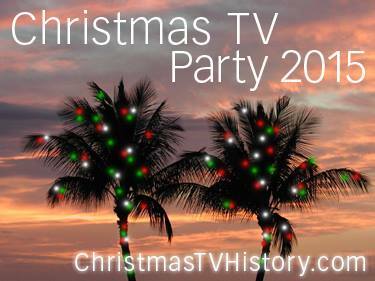 Not your typical Christmas TV movie, is it? Christmas in the Morgan home is filled with shadows and darkness. So far, these plot revelations are sort of beside the point. The film's strengths are the mood and tone. There's a severe rainstorm happening outside and many of the family conversations (and confrontations) are highlighted by lightning flashes and thunder. 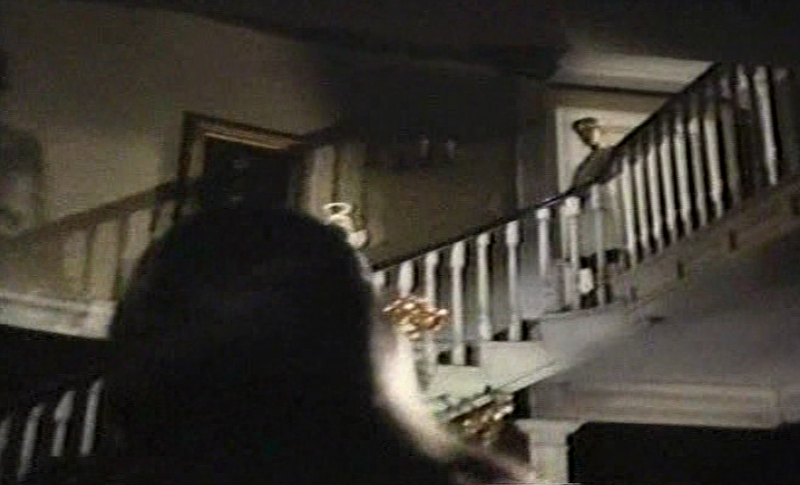 Despite the family hatred, resentment, and strife, the Morgans are gathered at Christmas time--there's a beautifully decorated Christmas tree at the bottom of the open spiral staircase in the home, and Elizabeth prepares an extravagant turkey dinner with all the trimmings for the Christmas Eve dinner. 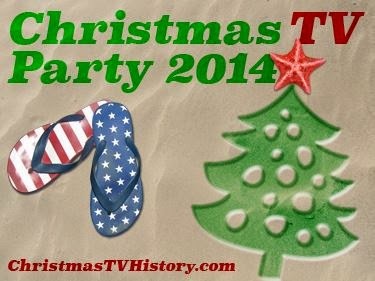 The disjunction between the warmth of the holiday and the family members' feelings for each other serves the tone. The story is off-balance and dark. It feels unpredictable--like anything can happen. Freddie had been drinking--was her death accidental? If possible, the story grows darker. Jo is fed up with her father's paranoid ramblings. She couldn't care less about him dying and she's not going to kill Elizabeth, so she decides to leave. In the garage before Jo can drive away, a woman in a yellow rain slicker uses a pitchfork to permanently stop her from leaving. Next, Freddie is found dead in her bathtub. Alex, Christine, and Elizabeth don't know if it was suicide, accidental drowning, or murder. 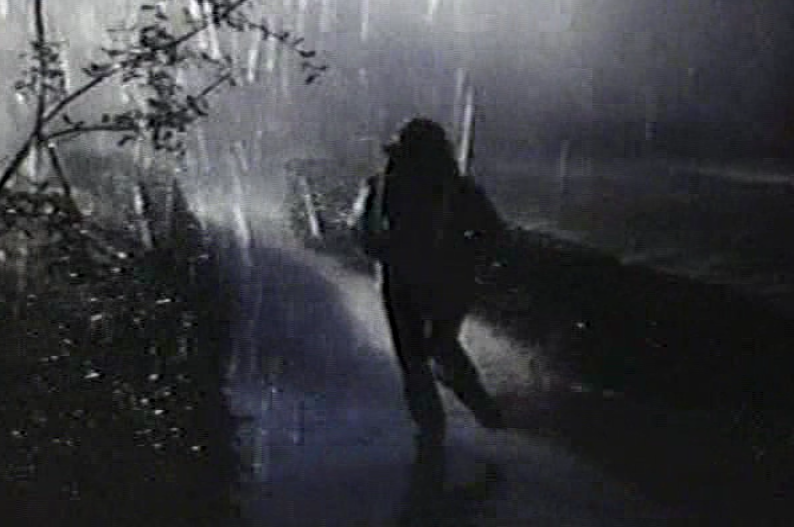 (But viewers know that the drowning was assisted by a woman wearing gloves from the kitchen sink). No one knows if they should be suspicious of each other or not. The phone is dead--now what? Too bad the phone is dead from the rain storm and they can't call the local sheriff. The road has washed away in the storm so they feel trapped in the home. Accusations are made--Christine thinks Freddie was suicidal but Alex accuses Elizabeth of poisoning Freddie's drinks. 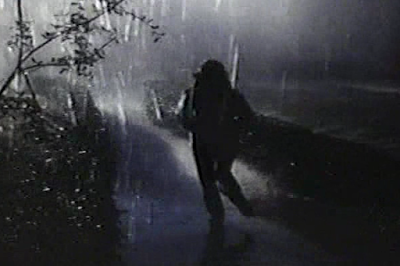 Christine feels helpless and decides to brave the rainstorm to walk a mile through the woods to a neighbor's home. Christine heads out into the rain. 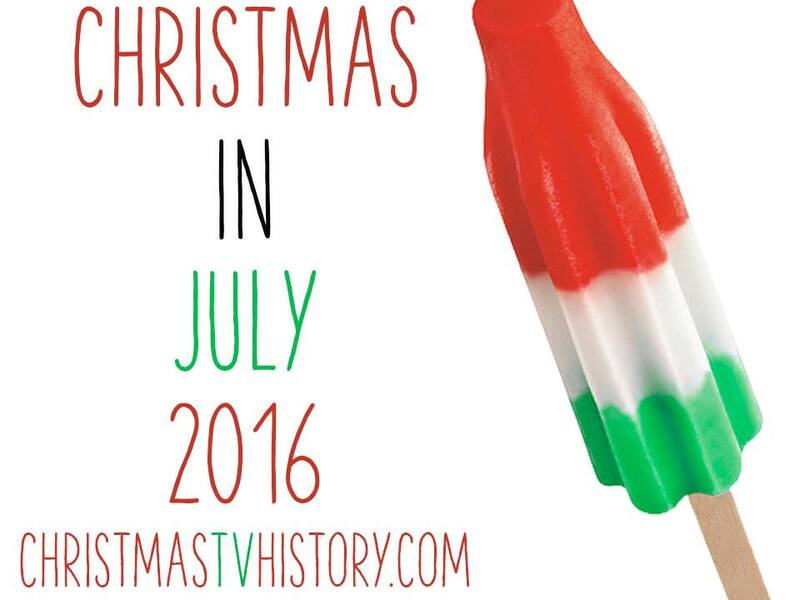 There's no snow in this Christmas story. Watch out! Someone in the yellow rain slicker and the pitchfork follows her into the woods. 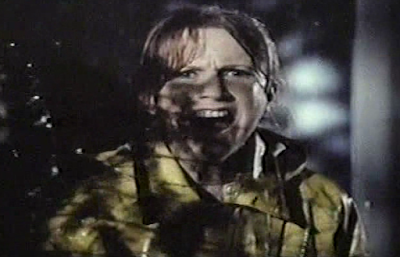 Christine escapes her pursuer and backtracks through the woods. She hides herself in the garage and discovers her sister Jo's body! Even though the nearest town is 10 miles away (and the road may be washed out), Christine takes to the road to look for help--and safety. "Come back, Christine!" Elizabeth isn't stupid--she knows they think she's horrible and dangerous. But she has a reasonable explanation for each accusation they throw at her. Christine finds her sister Jo never left after all. I don't want to reveal too much more. However, the killer's identity and motivation when revealed proves to be a satisfying ending. Each time I watch this movie, I like it more and more. 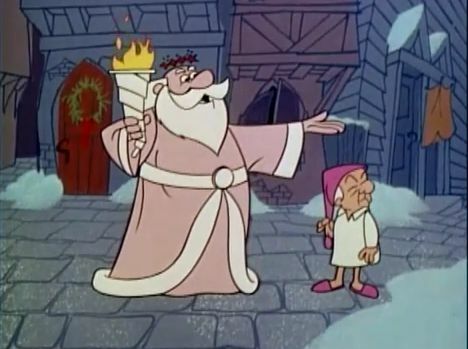 They don't make Christmas TV movies like this anymore. 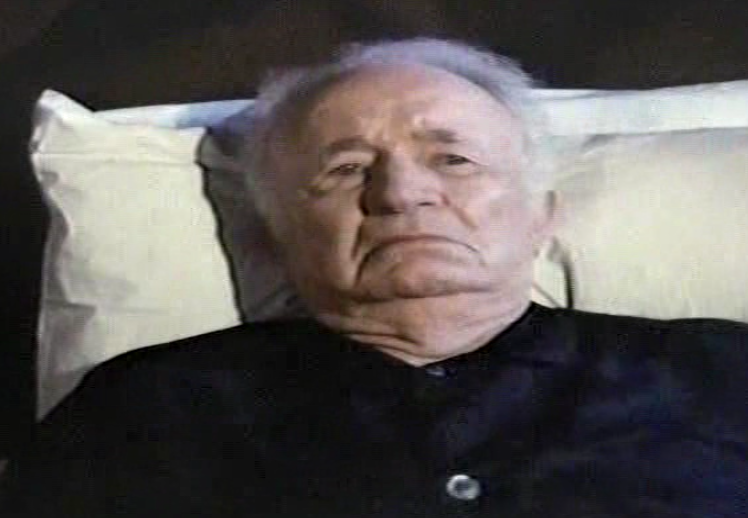 The father Benjamin Morgan is played by Walter Brennan. Another strength of this movie is its outstanding cast. Oscar-winner Walter Brennan plays the father Benjamin Morgan. I've seen Brennan in more westerns than I can name, and he played the cantankerous grandpa Amos McCoy on the 60s sitcom The Real McCoys too. It's easy to see him play the paranoid father that is estranged from his daughters. 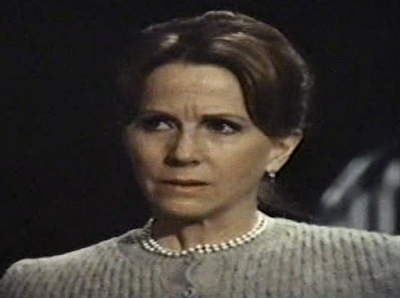 Another shining star is Julie Harris as the step-mother Elizabeth. I always think of the movie East of Eden (her co-star was James Dean) when I think of Harris but in fact, she earned praise for many roles throughout her long career. Sister Alex is played by Eleanor Parker. 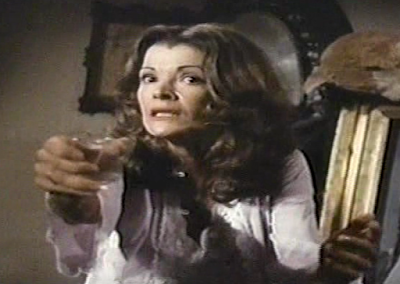 Sister Freddie is played by Jessica Walter who has also enjoyed a long career. You may recognize her for playing the mother Lucille Bluth in the more recent TV comedy Arrested Development. 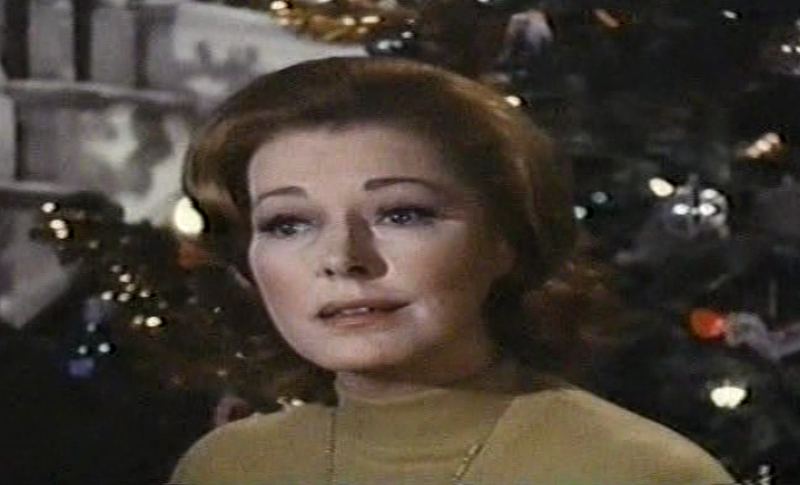 Oldest sister Alex is played by Eleanor Parker--I remember her most fondly as the Baroness in the movie The Sound of Music. And, the youngest sister Christine is played by Oscar-winner Sally Field. In 1972 when this movie was made, Field was already beyond her TV roles as Gidget and The Flying Nun but she hadn't yet made the movies Sybil, Smokey & the Bandit, and Norma Rae--all unforgettable roles. Don't wait to long if you'd like to watch it--this video will probably disappear soon. Make sure to comment if you're a fan of this movie like I am. 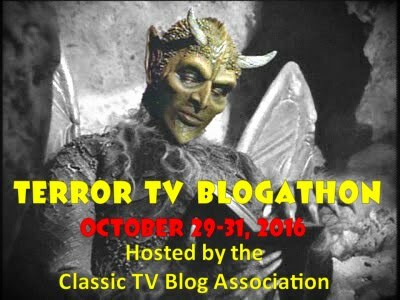 And please, check out the other essays in the Terror TV blogathon. My overwhelming memory of this film was rain. Rain, rain and more rain. Don't remember much else, but boy, did it rain! 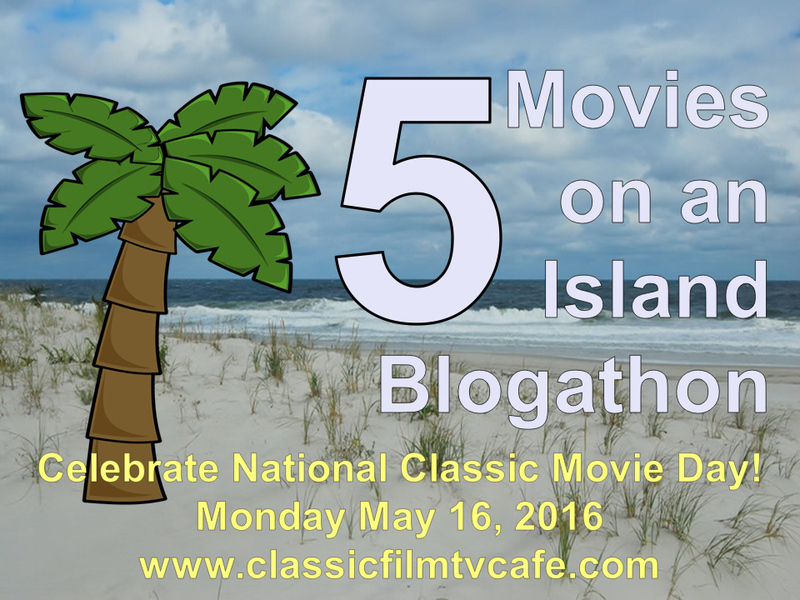 Joanna, what a great pick for the Terror TV Blogathon! I recently googled lists of favorite made-for-TV horror films and this one was on a bunch of them. 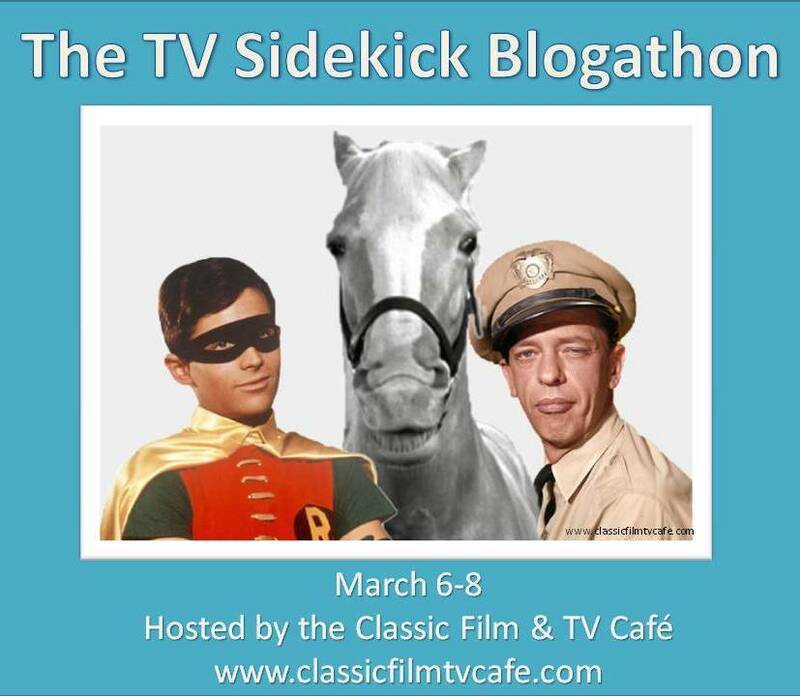 Plus, what a terrific cast! I haven't seen it in ages, but was pleased to discover it on YouTube. 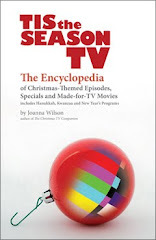 There truly is no place like "Home for the Holidays" but, from your synopsis, I am glad to visit this from the safety of my own armchair. 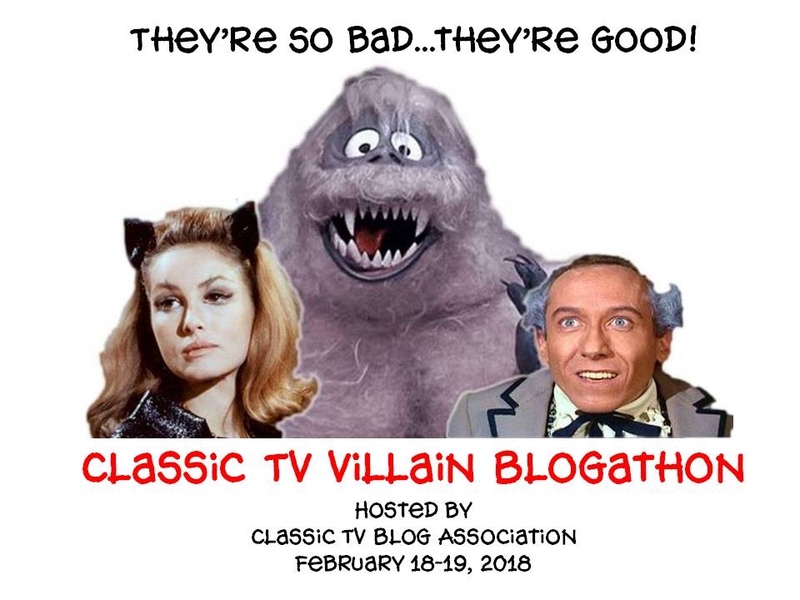 What an excellent selection for the Terror TV Blogathon! Now I have two movies to track down (provided I can get to them before they're "liberated" from the Internets). Wow! I can't believe the cast in this one! 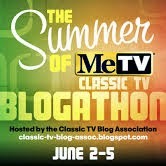 I don't recall seeing it way back when but I will get to it asap! Thanks so much for giving it some sugar here! Interior Design - Designing an interior is done for those who intend to live in the home for a period of time.Make The Simple Blog The homeowner has a desire to personalize their home for living.